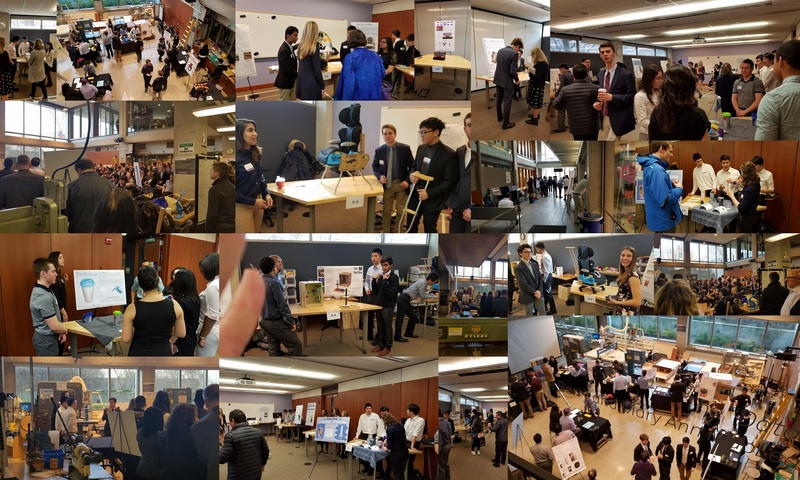 On Saturday March 17th, I had the great privilege to serve as a judge during the Winter Design Expo at Northwestern University. First-year students enrolled in the Design Thinking and Communication (DTC) course shared what they had designed for various clients including the Shirley Ryan Ability Lab. Many of the student projects supported the UN Sustainable Development Goal 3: Good Health and Well-Being. Design Thinking and Communication (DTC), is a required two-quarter course for all first-year students at Northwestern Engineering. DTC is a cross-school course jointly taught by faculty throughout the McCormick School of Engineering and Applied Science and from the Weinberg College of Arts and Sciences Cook Family Writing Program. An innovative course that embeds communication instruction in the context of design, DTC immediately puts students to work on real design problems submitted by individuals, non-profits, entrepreneurs, and industry members. In DTC, all students design for real people and communicate to real audiences. DTC was introduced in 1997 as part of the Engineering First® curriculum. This curriculum created a new pedagogy for engineering education and has been nominated for a National Academy of Engineering award for educational excellence and featured in the Wall Street Journal. The curriculum for this two-quarter course fulfills requirements in both engineering design and written communication and is team-taught by faculty from the McCormick School of Engineering and the Cook Family Writing Program in the Weinberg College of Arts and Sciences. This interdisciplinary approach epitomizes the strengths defined in Northwestern’s Strategic Plan and has been recognized nationally and internationally as a model in innovative education. The DTC curriculum is continually refreshed by new projects and rotating faculty. DTC’s collaborations with the Rehabilitation Institute of Chicago and other local non-profit organizations, such as Lambs Farm and Kids in Danger, help students appreciate the social impact of engineering. Every quarter, new and relevant topics like sustainability, engineering ethics, and global awareness are introduced to students. Completion of the first quarter is a prerequisite for the second quarter course. In DTC’s first quarter, students typically solve problems for people with special needs, such as rehabilitation or special educational recreation. In the second quarter, projects address a variety of problems in healthcare, industry, and education. A unique feature of DTC, as compared to introductory design courses at other universities, is that our projects are submitted by real clients and generally involve interaction with real users. Students learn skills that span designing a product for a person and telling a story to an audience. They learn that good communication leads to better design. Working in teams, students learn that both design and communication are iterative, context-centered, problem-solving processes. All communication deliverables are tied to the project work. DTC’s team-based approach, broad scope, and public events bring together diverse members of the Northwestern community and raise awareness of the importance of design thinking. DTC courses are held in studio classrooms in the prominent Ford Motor Company Engineering Design Center, centrally located on Northwestern’s Evanston campus. Its resources are shared by the Farley Center for Entrepreneurship and Innovation, the Segal Design Institute, and the McCormick School of Engineering. Thus from the beginning of their academic career, DTC students have the opportunity to interact with upperclass and graduate students in Ford’s classrooms, hallways, and the state-of-the-art Prototyping and Fabrication Lab. This was my second experience with the DTC class and once again I was thoroughly impressed with the quality design and professional presentations by Northwestern students. SAP continues to engage with Northwestern as we expand our innovation ecosystem partnerships in the Midwest. For example, we will be one of the sponsors of the upcoming VentureCat startup pitch competition in May.